Soft pretzels are a cinch to make when you use the bread machine to make the dough. Although you'll have to wait several hours for the dough to be ready, this soft pretzel is super easy for kids to make. Place the first five ingredients in your bread machine in the order specified by the manufacturer. Set the machine to the dough cycle. When cycle is complete, turn dough out onto a lightly floured surface, and let it rest a few minutes. Meanwhile, preheat the oven to 475 F. Get out two baking sheets, and place a rack over a third baking sheet. Divide dough into 12 to14 equal pieces. Roll each piece out to a 15-inch rope. Make a U with each rope, then cross the ends. Pick up the ends and twist, then fold up to make a pretzel shape. Pinch to seal. 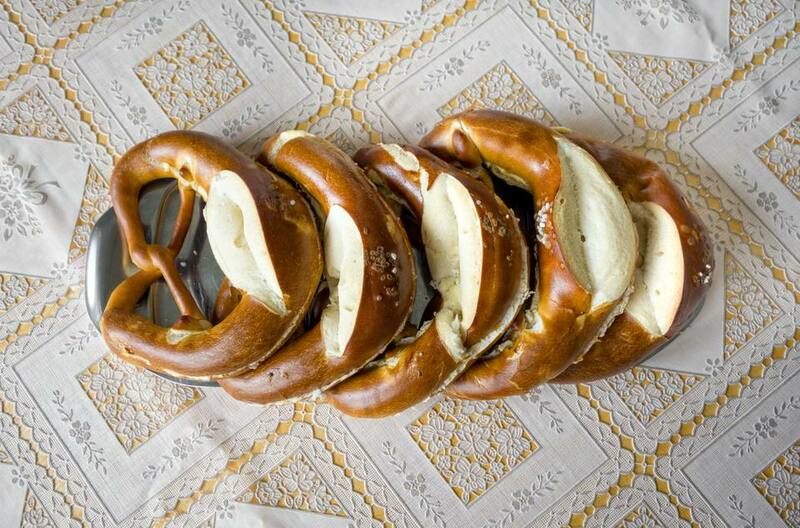 To see what this looks like, check out this step-by-step tutorial on how to make soft pretzels. Place the pretzels on the salted baking sheets. Place the 2 quarts of water in a large saucepan. Bring to a boil. Add the baking soda, then reduce the heat to a simmer. Slide 2 to 3 pretzels at a time into the baking soda bath. Let them simmer about 2 minutes. Use a slotted spoon to remove the pretzels. Transfer to the cooling rack. Sprinkle with kosher salt. When all of the pretzels have come out of the baking soda bath, transfer them to the salted baking sheets. Bake 8 to 12 minutes until golden brown.